This weekend my mom will be celebrating a special b-day – her 80th birthday! She’s not only my mother, she’s my best friend. She doesn’t look eighty, and she doesn’t act eighty. Here is a re-post from January 2016 to give you an idea of what I mean. This is how my mother shops for clothing. When she sees something she likes – be it a blouse, or a particular style of pants, not to mention shoes – she’ll buy it in several different colors. It’s insanity, I know, but now she’s even got me doing it. 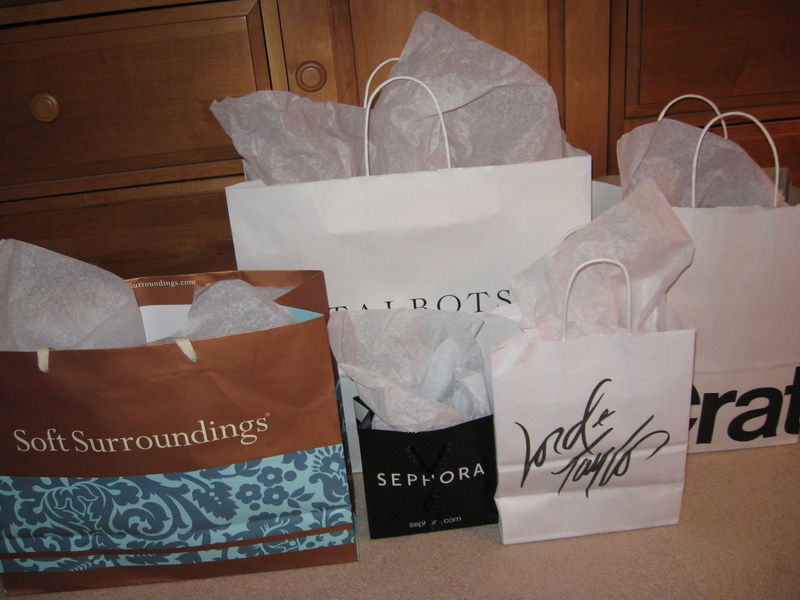 Yes, all I’ve learned about shopping, I’ve learned from my mother. You’d think living over two hundred miles apart would’ve put a crimp in our shopping expeditions, but it hasn’t. When I’m home for the weekend, our shopping marathons lead us to fine stores everywhere. And when she’s visiting me, we often drive up to the outlets in Kittery for a full day of shopping in the great state of Maine. When I offer to pay for said item, she flatly refuses. And I don’t have the heart to point out to her that whatever she supposedly saved on the sale, she’s more than spent on the FED EX charge. Her other big rationalization for committing what can only be described as consumer carnage is that she wasn’t even looking for this latest treasure. “I fell over it!” she’ll insist. Despite all the shopping, one of my mother’s greatest gifts to me is not something she purchased, but rather something she taught me. How to always, always, be generous. You and your Mom have such a great relationship. It’s a joy to read and hear about it! thanks Mary Anne! We’ve had a great celebration! Happy Birthday Mrs. Colacino!! May you be showered with unexpected blessing through this new year. Thanks for your kind words, Sheila. As both a mother and a grandmother, I’m sure you have some fun gals to go with on a shopping spree!